LIBERTY SHOES has always promised to provide, to all its Institutional Customers, a Safety Shoe which ensures complete safety to the user. We work determinedly to ensure that every Safety Shoe is so made that it saves the life of the end user who is at a potential danger. 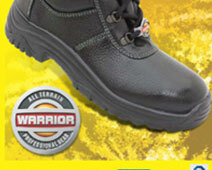 It has come to our notice that duplicate WARRIOR SAFETY SHOE have been spotted in the market. Such manufacturers are gaining monetary benefits on the established WARRIOR brand. This is depriving the end user, of the performance that WARRIOR promises to deliver to its customers. WARRIOR has initiated a drive against this duplicity and has been successful in locating such manufacturers / traders / agents who are producing and selling duplicate WARRIOR Shoes in the market. 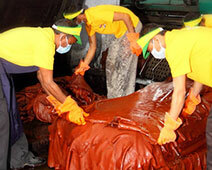 We have managed to raid a few premises recently. Strong action against them has also been initiated. We stoutly caution all WARRIOR users of the duplicate products in the market and request you to bring to our notice any such activity that you may come across. We promise to keep fighting against the menace of duplicity for which we seek your support. "WARRIOR- A DECADE DEDICATED TO SAFETY"